Sign the petition, and remind friends - especially those who live some distance from the downtown - to sign. Write a letter to the editor, and encourage others to do the same. The deadline for the Easy Reader and the Beach Reporter is Monday at noon. Letters to the Easy Reader should be submitted by email. Here's a post-referendum letter (approx. April 16) from a resident to the City Council. We are writing you to express our growing concern about our city. This recent parking referendum dust-up is really only the tip of the iceberg of a much bigger problem…we’re losing control of our downtown. Although Sharkeez has been singled out in recent days, the truth is that our bar problem is much bigger than just Sharkeez. When we tried to talk to Jim in front of Vons last week, we were accosted by Sharkeez employees and harassed. We were told that we “don’t care about” their jobs. Well, we do care. We care that all people are able to work, but if these people worked for an auto plant that wanted to move into our downtown, we’d have to look at the larger effects on our community. We feel terrible for the Newmans having lost their business to a fire. We went to high school with the Newmans. We’re neighbors. But facilitating rebuilding is one thing…allowing Sharkeez to expand is another. How did this decision happen in the first place? Downtown Hermosa is already like Fraternity Row. When we walk through downtown at night, all we see is a string of bars with bouncers. These establishments are attracting a very rowdy, drunken crowd. One night, we came out of Italy’s Little Kitchen at 9:00pm to find a passed-out woman on the sidewalk. Her companion picked her up, slung her over his shoulder, and walked away, stopping to urinate against the wall in the alley. And this now is sadly the norm for a night downtown. In the mornings when we walk our dog, we find our streets littered with trash, vomit, broken bottles…but you know all this. When we told one of the Sharkeez employees that we enjoy walking downtown for dinner with our daughter, one of the employees scoffed, “You bring your daughter downtown at night? You’re crazy.” Isn’t that a sad reaction from people who work downtown—that our downtown is too dangerous for families? The California Department of Justice statistics tell us that felony and assault arrests have doubled, misdemeanor arrests have tripled, and misdemeanor assaults have gone up more than 500% in the last ten years. Theft and DUI arrests have also substantially risen. In neighboring Manhattan Beach, many of these same crime stats have decreased or risen at a substantially lower rate than those of our city. But we don’t need statistics to tell us crime is getting worse in our city. We see it. So, what are we doing wrong? Well, it’s pretty simple. There are too many bars. We are touted across the country and Internet as "Best Bar Town." We recently learned that most of these establishments with bouncers and dance floors and which stay open until 2am are classified as “restaurants.” Why is that? Because they serve as much food as alcohol? Have any of these establishments ever been audited? And what gets served more between the hours of midnight and 2am? And let’s not forget that when these places close, the drunks spill out into our city. We have at least one drunk-driving accident every year right outside our house on Monterey. Maybe the solution is simple. If these establishments are restaurants, they should act like restaurants. Restaurants should close by midnight. Restaurants also shouldn’t be a burden to our police, and when they are, they should be penalized. What are the ramifications when an establishment goes over its “quota” of police calls? Is there a quota? If so, are there any ramifications? How much tax revenue are we earning from the bars, and how much does it cost to police them? And honestly, is there any amount of tax revenue worth promoting drunk drivers and an unsafe downtown? The bottom line is this: People like ourselves and other local anti-bar activists have no ulterior motives. We are simply looking out for what is best for our community. The bars and their employees only care about their pocketbooks. Let’s stop letting the bars pimp our town. Let’s take it back and turn it into the beach-loving, family-friendly environment many of us expected when our city renovated Pier Plaza. Let’s start trying to attract anchor retail establishments, like an Urban Outfitters. Let’s attract the kind of consumers that don’t have a NEGATIVE impact on our city. 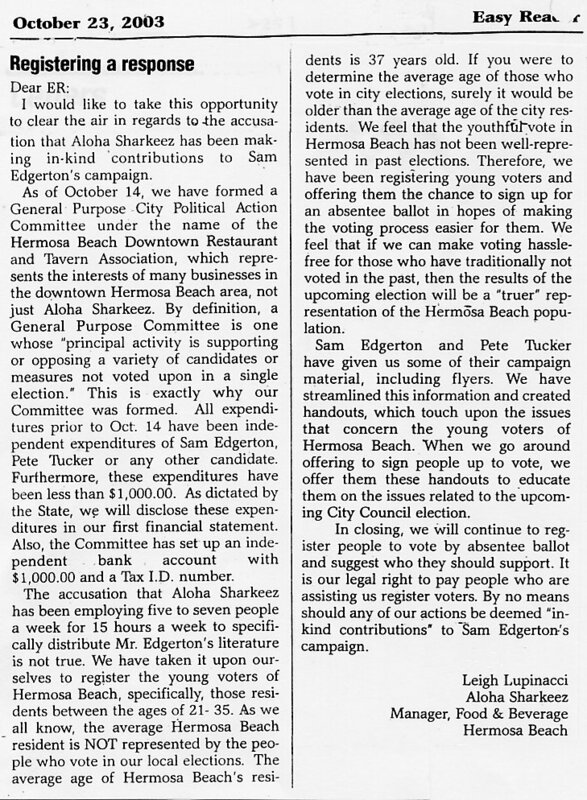 Another post-referendum letter: On Thursday April 19 there was a pro-Sharkeez letter in all three local newspapers, signed "Leigh Lupinacci, Hermosa Beach." It turns out that Lupinacci is a manager in Sharkeez' corporate office - but her letter didn't disclose that. Googling her name, we found this letter she wrote during the council election of 2003. Back to the present. 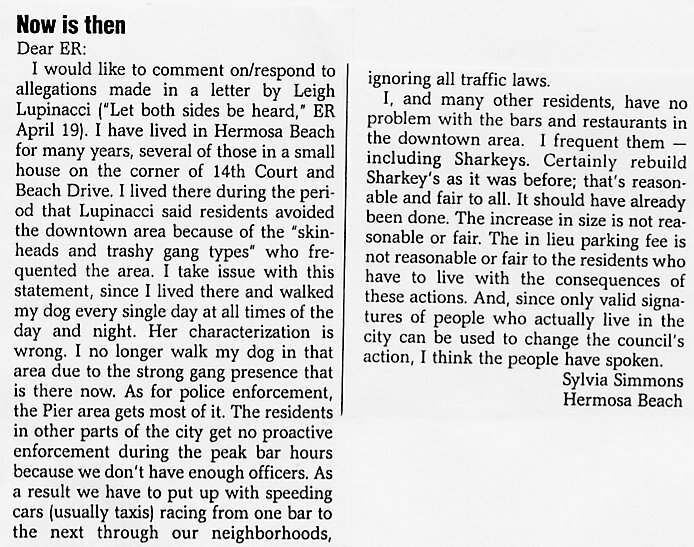 Here is an April 26 reply to Lupinacci's 2007 letter.